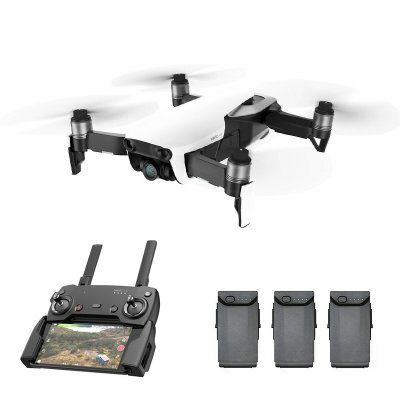 Successfully Added DJI Mavic Air Drone Combo Pack - 4K Camera, 32 MP Sphere Panoramas, SmartCapture, GPS/GLONASS, 21-Minute Max Flight Time (White) to your Shopping Cart. DJI Mavic Air folding drone Combo Pack. Now with 2 extra batteries and spare propellers all coming in an awesome shoulder bag for easy carrying. The Mavic Air is the most portable DJI drone with 3D fold design with smaller size and stronger performanceto, house a 3-axis mechanical gimbal,up to 21 minutes fly time, 3-direction detecton system, and advanced aids system and one key reture mode, you will get a safe and extraordinary fly experience. Inheriting the advanced technology, this ultraportable and foldable drone features high-end flight performance and functionality for limitless exploration. The Mavic Air brings you a new world!.